Maps help policy makers consider all aspects of issues and communicate their positions to fellow government leaders and citizens. Policies reflect a nation’s identity—its values and ambitions. In our modern, interconnected world, understanding policy issues and making the right decisions are critical to creating a sustainable world. When it comes to issues like climate change, use of natural resources, energy, healthcare, and economic growth, policy makers need a way to see all of the factors at play and potential impacts. How will their decisions impact people today and 10 years from now? As leaders from all levels of government consider key issues, they are turning to GIS. Unlike any other technology, GIS takes big data and makes it easy to understand. Maps can show where money is being spent—is it going to areas of greatest need or to well-heeled neighborhoods? Maps can show where resources are harvested and how that impacts surrounding lands. Maps helps policy makers consider all aspects of issues. Once they have a deep understanding of an issue and take a stance, maps help them communicate their position to fellow government leaders and citizens. In the US, the White House uses GIS-based maps to shed light on critical issues such as budget impacts, the effects of school funding cuts, and the need to create workplace policies that support families. Members of the U.S. Congress also use maps to explore pressing issues. Senators like Lisa Murkowski of Alaska know GIS facilitates understanding of complex issues like access to land and water in Alaska. Senator Ron Wyden of Oregon uses maps to engage people in discussions about topics including the Better Care, Lower Cost Act. U.S. Congressional committees like the Senate Committee on Energy and Natural Resources and the Committee on Homeland Security use maps to study and assess the impacts of policy decisions on issues such as border security. For modern governments, GIS is now essential to policy making. There are great examples of this in small European countries, too. In those countries, GIS is the foundation for analyzing issues, gathering and understanding public sentiment, and discussing ideas. Going hand-in-hand with the increased use of GIS in policy are the massive efforts to open government data for public consumption. GIS-based open data portals like the Halifax, Nova Scotia, Canada, open data portal fuel policy maps. When financial, demographic, and scientific data is easy to access and use, policy makers can put into web maps to better understand and communicate policy issues. GIS is the new medium for reaching citizens. People intuitively understand data when they see it in a map and it moves them to act. Leaders who recognize this and use maps to present their opinions, have a competitive advantage in public forums. Long reports don’t reflect the way people like to consume information today. Expecting citizens to download PDFs or read volumes on their smartphones is unrealistic. Maps provide the bridge that links policy makers with the public, fostering an informed and engaged citizenry that leads to a robust democracy. And the insights GIS provides to those running for office are remarkable—but that is a discussion for another day. There are countless ways that GIS can be used in policy making. How can you use GIS to better understand and communicate policy issues? If you attend the Esri User Conference next week, visit a special exhibit on GIS for Policy in the National Government Showcase to find out. In this dedicated area of the GIS Solutions EXPO in the San Diego Convention Center, you’ll see more examples of the role GIS plays in policy and you’ll have the opportunity to talk with people supporting it. 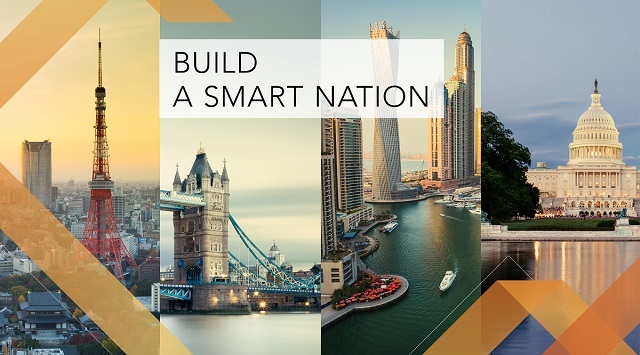 Ultimately, we create smart nations through smart communities. To achieve this, people at all levels of government need to work together to create good public policy, share data, and engage the public. ArcGIS is the platform that supports these efforts to build a better, more resilient world. You can also find many resources on Esri’s website and see more examples in this video from WJLA ABC7 in Washington D.C. If you’d like to speak with someone directly, please contact Lauren Lipovic at LLipovic@esri.com.